Serving over 14,000 students, approximately 1,200 faculty members and nearly 2,500 staff in 54 buildings covering 104 acres on the hilltop, the Georgetown University Police is committed to helping maintain a safe and secure environment on Georgetown University's main campus. Keeping our Georgetown campus safe from active shooter/active aggressor incidents is a top priority and the campus takes a team approach. These groups include the Georgetown University Police Department (GUPD), the campus Threat Assessment Team and the Department of Emergency Management and Continuity of Operations (DEMOC). The website is designed to be an informational guide on how to report a threatening person or a person of concern, how to identify resources that will provide emergency information to help you make decisions on how to keep safe and information how to stay safe during an active aggressor incident. Please take a moment to familiarize yourself with the information provided on the site to empower yourself to stay safe on campus. Click here to view services and sponsored events. See something? Say something! Click here to submit an anonymous report to GUPD. Women's Self Defense class available. Click here to view dates and times. Welcome to the Georgetown University Police Department Website. We hope that you take a few minutes to explore the information that is provided. 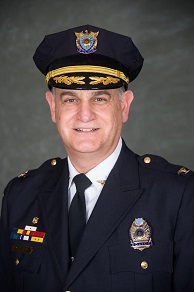 Georgetown University Police Department’s mission is to protect the Georgetown University community, ensuring a safe and secure learning and living environment through trusting partnerships and professional police services. We are committed to the concept of community policing and work diligently to develop and maintain partnerships for improving the quality of life for our campus community. We take the issue of campus safety seriously and we will continue to work in developing new programs to make our campus as safe as possible. I ask for the assistance and cooperation of every member of our community and invite you to join us by doing your part to protect yourself and your property. Together, we can make our campus a wonderful place to live, learn, work and visit.